Renowned Tibetan lamas and western scholars are invited to teach from classical buddhist texts by the great masters of the past, relating them directly to the experience and practice of western Dharma students, and with a view to supporting the needs of the wider Rigpa sangha. The Shedra West programme ran succesfully between 2001 and 2005 at Lerab Ling before the Shedra East programme was started. It then resumed in May 2010, with teachers like Khenpo Pema Sherab and Ringu Tulku Rinpoche coming every year. 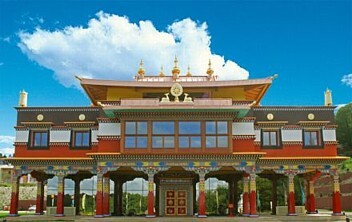 Senior Shedra students and instructors will also hold study weekends in national Rigpa centres. This will give local sanghas a flavour of the Shedra and encourage more students to devote themselves to in-depth study. A long term aim of the Rigpa Shedra is to establish a Shedra in every continent and, where possible, to gain university-like formal recognition.